David Felder, director of the Center and Birge-Cary Professor of Composition at UB, is widely known as a leader in his generation of American composers. His music has been heard at major international new music festivals worldwide, including those in Holland, Huddersfield, Darmstadt, Brussels, Geneva, Ravinia, Aspen, Tanglewood, Bourges, and Vienna, to name a few. Commissions include works for the New York New Music Ensemble, Arditti Quartet, American Composers Orchestra, Buffalo Philharmonic, American Brass Quintet, and many others. His work has been broadly characterized by its highly energetic profile, through its frequent employment of technological extension and elaboration of musical materials (including his “Crossfire” video series), and its lyrical qualities. Two brand-new recordings offer a superb introduction to his compelling work. 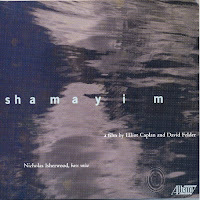 Shamayim, released October 1 (Albany 1137), is a DVD documenting a film collaboration between Felder and filmmaker Elliot Caplan. December 1 brought BoxMan (Albany 1153), a composer portrait CD compiling works written for the Arditti Quartet, New York Virtuoso Singers, New York New Music Ensemble, and trombonist Miles Anderson. Together, the two releases reveal a composer at the height of his powers. Shamayim began with Felder’s work with Nicholas Isherwood on a piece for voice and electronic sounds and Caplan’s interest in a series of images having to do with nature. Shamayim uses Hebrew letters as the base structure for the music, while Caplan uses the numeric values of these letters as inspiration for the images. 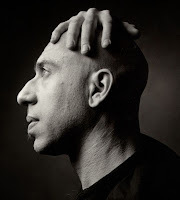 In some cases, Caplan attempted to be as close to the sound as possible in creating the images and in others Felder would compose based on the images. The results are strikingly beautiful: meditative yet rich in incident. Isherwood's resonant, sometimes eerily deep voice is set against an everchanging electronic backdrop that evokes the mysterious workings of the natural world. The Italian website MusicalNews.com called Shamayim "A DVD not to be missed: a masterpiece of our times. 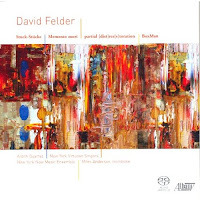 The music of Felder looks to the future with deep roots in the past in a spiral of sounds that envelop the viewer." At first glance, the four compositions on the BoxMan disc might seem very disparate: Stuck-Stücke, an aphoristic string quartet; Memento mori, an elegiac piece for unaccompanied choir; partial [dis]res[s]toration, a sextet with electronic ambience; and finally the title track, a theatrical trombone solo in which the electronic interventions come right into the foreground. On listening, however, the differences begin to dissolve, leaving behind them the outlines of a distinct creative personality. One feature they share is fearlessness; another is their rhythmic dynamism and another is the containment of rhythmic and harmonic tensions in small motifs. Reviewing BoxMan in the Buffalo News, Mary Kunz Goldman wrote, "UB composer in residence David Felder has a sense of humor that runs like a live nerve through this record, adding a needed extra dimension to sounds that would otherwise be alien to the ear. The sparks and spiky texture of one of the Stuck-Stuecke—good title there—appeals when you see it is marked “Effervescent.” “Mechanically!— incessant,” “Chorale-still,” “Bubbly”—the evocative words sum up the sounds brilliantly. [Felder] seems to be trying to put something into music that cannot be put into music. A string quartet has to make a sound like murmuring, or dancing, or breathing, or bouncing off the walls. In “Memento Mori,” a chorus takes up the challenge and it sounds otherworldly, like the sounds picked up by ghosthunters at the Iron Island Museum. I kept visualizing the changing harmonies like rays of light passing through a prism." "All of us in the Music from Copland House ensemble had a really rewarding and enjoyable visit to UB for our all-too-short mini-residency in mid-November. Besides our public concert celebrating the legendary Nadia Boulanger and her American students (including, most prominently, Copland himself) and several performance master classes for UB piano, wind, and string students, our activities on campus included our public reading of three strong new works by UB students: (Dis)tenzione for clarinet and piano by Paolo Cavallone, the String Quartet No. 2 by Moshe Shulman, and Spate (Resonantia Machina) by Ethan Hayden. "Two things struck us about all three compositions, despite the fact that they were very different works, reflecting highly diverse idioms, objectives, character, and creative approaches. They all had very distinctive musical profiles and artistic personalities, and were solidly, expertly crafted. Paolo’s delicate work had a very definite European sensibility, inhabiting an ethereal, mysterious sound world. Moshe’s wide-ranging quartet explored all kinds of musical gestures and was full of flamboyant and dramatic flourishes, sometimes complemented by the percussive sounds of tapping instruments and stamping the floor! Ethan’s short but dramatic composition was a driving, rhythmically spiky study of massed or opposing instrumental lines and sonorities, interrupted by a brief spare, serene interlude. Our individual and collective suggestions about these works generally involved instrumental possibilities and minor technical or expressive refinements, as well as issues regarding how composers interact (through their works) with their performers and their audiences. "We really wished we could have spent more time with all these works and their composers, just as we were sorry we weren’t able to stay longer at UB. We’re very grateful to our hosts, David Felder, Carol and Bob Morris, the UB Music Department, and the Center for the Study of 21st Century Music, for making our visit possible. UB’s illustrious history supporting the music of our time is well known. 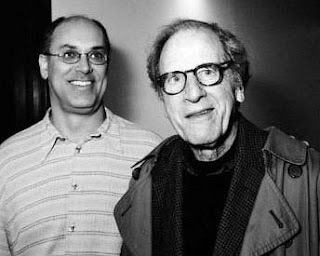 As performers who, both individually and representing Copland House, enthusiastically champion contemporary composers and America’s rich musical heritage, we were thrilled to see how UB’s vibrant legacy continues to thrive so impressively!" BTW, this coming Sunday (Dec. 6), Music from Copland House is presenting a talk called "Off the Record" by Alex Ross, taking place at Copland House at Merestead, Mt. Kisco, NY. Further information available here. On Tuesday, October 27 (7:30 pm), the Slee Sinfonietta serves up a quartet of chamber works at Lippes Concert Hall, dating from Messaien's spellbinding Quartet for the End of Time (1941) to conductor Harvey Sollberger's 1987 original substance/manifests/traces, with new UB faculty member Barry Crawford on flute. Franco Donatoni's fleet and inventive Arpège (1986) and Toru Takemitsu's enchanting Rain Spell (1983) round out the program. Regarding the latter work, Stylus magazine noted that its "relatively rich, shimmering textures place it again in Debussy territory as sort of an atonal take on Prelude to the Afternoon of a Faun." Ticket information is available here. Just added to the Audio page on the Center's website: excerpts from the Slee Sinfonietta's September 15 concert at Lippes Concert Hall, including works by Bach, Bloch, and Ligeti. Click the "+" sign on the music player, then choose "Slee Sinfonietta 2009" to listen. More than 150 images from the 2009 June in Buffalo festival are now on view at the Center's searchable photo gallery. They were taken by Irene Haupt, who has been chronicling the Center's activities since its inception, and capture JiB seminars, rehearsals, concerts, and assorted candid moments. 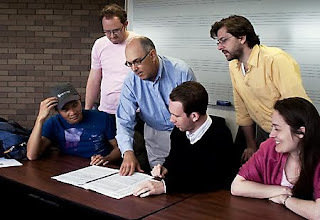 Here, David Felder looks over a score in a master class with JiB Participants Andrew Ly, Christian Gentry, Matthew Schreibeis, Todd Tarantino and Eleanor Aversa. They join the Center's ever-expanding library of images, which currently stretch back four seasons, with more to come. The JACK Quartet's open reading of student works on October 14 is part of a short residency that includes a concert the previous evening, Oct. 13, at Baird Recital Hall. JACK is particularly noted for its command of technically demanding avant-garde repertoire, and this program is an apt showcase for the group's skills. Their program opens with Iannis Xenakis's Tetora, also heard on JACK's new disc surveying all four of Xenakis's works for string quartet (Mode Records 209). 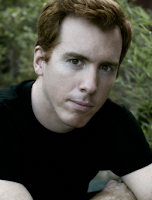 Next is Aaron Cassidy's String Quartet; on his website, the composer avers his "uncompromising dedication to instability and fragmentation." The world premiere of experimental composer Robert Morris's Arc follows. After intermission, Italian master Salvatore Sciarrino's String Quartet No. 7 is heard; his music is noted for its use of extended playing techniques and sonorities that seem to skirt the edge of perception. The program closes with The Boreal by Elliott Sharp (right), an alumnus of UB's graduate composition program who has gone on to international renown in a variety of genres. As noted below, the Center's 2009-10 season features visits by a tempting array of topnotch ensembles. On October 14, the NYC-based JACK Quartet will perform as part of the Center's Wednesday Composer Series, reading a selection of works by students in UB's composition program. Lucky students! 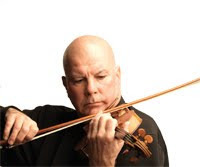 JACK - the name is an acronym derived from the first initials of its members, John Pickford Richards (viola), Ari Streisfeld (violin), Christopher Otto (violin), and Kevin McFarland (cello) - is rapidly gaining notice for high-energy performances of today's most demanding works for string quartet. 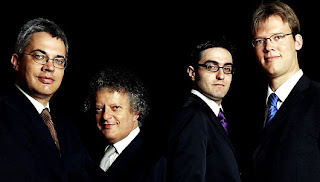 The New York Times called the quartet's performance of Iannis Xenakis' complete string quartets one of the "most memorable classical music presentations of 2008," and in 2009, the group received an ASCAP/Chamber Music America Award for Adventurous Programming of Contemporary Music. Commissioning and performing new works for string quartet is central to the group's mission, leading them to work closely with composers Helmut Lachenmann (who'll be visiting the Center in April), György Kurtág, Matthias Pintscher, Wolfgang Rihm, Elliott Sharp, Samuel Adler, and Aaron Cassidy. Upcoming premieres include works by Caleb Burhans, Peter Ablinger, and Alan Hilario. Here's a clip of JACK playing the opening movement of New York composer Christian Amigo's String Quartet No. 1. June in Buffalo alum Christian Carey continues his JiB reminiscences on Sequenza21.com with a cliffhanger tale on how a performance of his music was rescued by cellist Christopher Finckel. Carey now teaches composition and theory at Westminster Choir College. His music has been performed by the New York New Music Ensemble, the Cassatt String Quartet, the Aspen Contemporary Ensemble, and Ionization, among others. Thanks, Christian! Welcome to the official blog of University at Buffalo's Center for 21st Century Music, home to the legendary June in Buffalo festival, the Slee Sinfonietta, and a host of other programs devoted to the music of our time. The Center for 21st Century Music has roots that stretch back to 1963, when Lukas Foss (who passed away in February) founded UB's Center for Creative and Performing Arts. 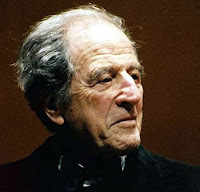 Foss, who also served as music director of the Buffalo Philharmonic from '63 to '70, was determined to establish the city as an international center of musical experimentation. To that end, he brought in composers and performers like George Crumb, David Del Tredici, Mauricio Kagel, Frederick Rzewski, Jan Williams, and Julius Eastman to become Creative Associates and participate in the Center's concerts and educational activities. 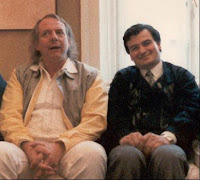 Morton Feldman became director of the Center in 1973, and two years later instituted June in Buffalo as an American answer to Darmstadt -- a place where student composers could gather and learn from an awe-inspiring array of elders from across the stylistic spectrum, including John Cage, Elliott Carter, John Harbison, Mauricio Kagel, Alvin Lucier, Steve Reich, Christopher Rouse, Poul Ruders, and Charles Wuorinen, along with many others. The Center for Creative and Performing Arts was succeeded by the Center for 21st Century Music, founded by David Felder in 2006. Felder, a distinguished member of the UB composition faculty since 1984, revived June in Buffalo in 1986 after a six-year hiatus. C21CM programs include the Slee Sinfonietta, the Center's flagship performing ensemble; the Hiller Music Studio for projects in advanced music technology; and a concert and lecture series that features noted composers, performers, and ensembles from around the globe. The Center for 21st Century Music has a distinguished past and an exciting future. We hope you'll visit our blog regularly for news, treasures from the Center's rich archive of audio and visual treats, and many other items of interest.